Whiteboard Training Camp | Gary G. Abud, Jr. This entry was posted in Activities AMTA Education Reading Strategy Teaching Whiteboarding and tagged Activity Consensus Building Discourse Modeling Instruction Questioning Teaching Whiteboarding on July 27, 2013 by Gary G Abud Jr.
Whiteboarding is one of the most fundamental learning tools of my classroom. Students use 2′ x 3′ whiteboards to construct lab write-ups, share experimental data, solve practice problems, compare and contrast ideas, and make their thinking visible to others. The basic notion behind using whiteboards is not much different than using flipchart paper, or butcher paper rolls with students. A sizable surface is provided to students for them to brainstorm their ideas and create a visual aid to accompany the sharing of their ideas. Making thinking visible is such an important element of the learning process, because it helps students to really reflect on their own ideas and create a mechanism for refining ideas through discourse. I’ve written and presented on using whiteboards in the chemistry classroom in the past, and it goes very nicely with Socratic dialogue and questioning techniques the help students to learn in constructivist manner. After about a month of using whiteboards and engaging in the process of whiteboarding, students operate more or less on autopilot with the practice. Students get accustomed to asking their own questions and running the discussion with less and less prompting. It’s truly a sight to behold. Many teachers who use the Modeling Method in the chemistry or other science classes, know the value of getting their classes to successfully whiteboard and discuss with their class. But many who would like to try whiteboarding out in their classes, or have their students use it as a successful learning tool, wonder how to achieve student buy-in, especially from those who would otherwise seem disenfranchised by having to participate in such a process. I have encountered the same concern in getting students to buy-in to this method of teaching and learning. What I have found, however, is that it is a practice and needs training. To achieve buy-in with any students, especially struggling/reluctant learners, training within a low-risk environment is absolutely necessary before the process can be used to teach content. Students are given a short story, a very short story. It’s only a single paragraph, almost like a news brief. It is very content rich, and contains information about six characters in the story. The nature of the storyline is controversial, which is intentionally done to evoke lots of interest, intrigue, thought and wondering from the students. The more dramatic the plot, the more it draws students in to the activity. Since it is very short, the perception of success in completing the reading activity is very high. Also, the storyline is something that appeals to the ethos of students in my classroom (teenagers.) 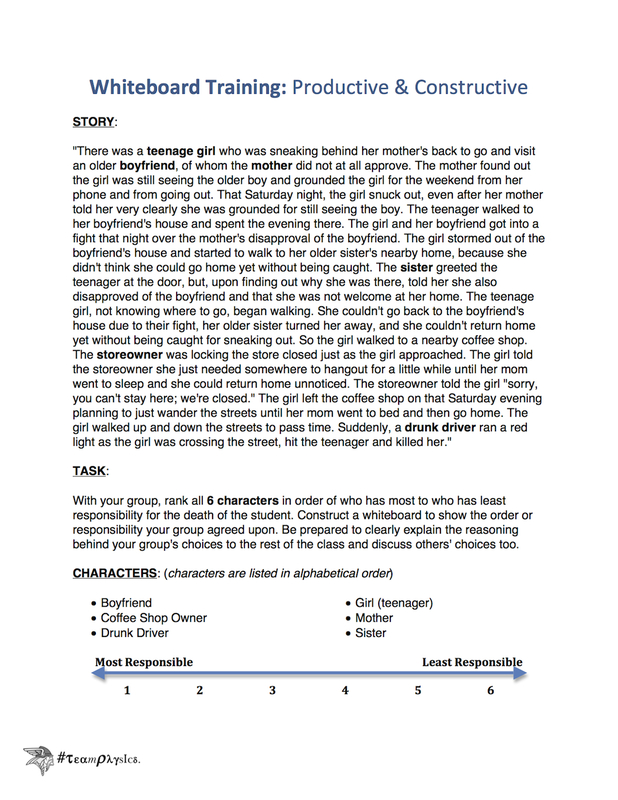 In the story, some tragic event occurs in the story and students are asked to rank the characters’ responsibility for the event based on what they read. Based on the multiple ways that students might read into the story, there are several arguments for responsibility that can be made. After reading, student groups (usually 3-4) must construct a whiteboard to present/discuss with their classmates and have to argue their point in a structured discussion facilitated by the teacher. Inevitably, students draw on their emotions, inferences, and outside experiences to speculate and support their claims. This gives us a number of talking points during the discussion and afterwards when we debrief the process as a whole class. You can get great buy-in from students with a low-risk activity like this, which also has tremendous teaching application, if done early in the year. If you try the story out with your students, share your experience in the comments below. You may even wish to complete the activity yourself beforehand, try it out with a group of colleagues, or even as an opening staff meeting activity. This is a versatile activity that can be repurposed for the sake of whiteboarding, group discussion, or argumentation. It could easily be used in non-science classes as well. Below is a story that I created to use with physics students for Whiteboard Training Camp. Feel free to use it or adapt it for getting your students going with whiteboards in the classroom. Click here to download the Whiteboard Training Camp Story. I am having trouble seeing the image… can you make a link to download it? Thanks! Thanks for letting me know. It should now be resolved that you can better see the story and download the PDF file as well. Love your description of how to train students to get everything possible out of whiteboarding. I can’t actually see or read your story though. Would you be willing to share it via email perhaps? I’d love to read it and possibly use it with my students. There are so many lessons that can be taught using this activity, I think you’ll enjoy giving it a try with students. Thanks for letting me know about the visibility. I’ve made the necessary changes and you should be able to view it in the post better now as well as download a PDF of it. Please provide some feedback on your experience when you give it a try. Interesting! Then, as they share their different views using the whiteboards to communicate their scales, they would go through the same process of claims-evidence-reasoning to justify their ideas and arrive at consensus. Nice idea. You can certainly use this process with a variety of topics or aspects of class. The main goal is to focus on the process. Thanks for sharing! I love the whiteboard training story, and I just used it today with my students with a great deal of success. I was wondering, do you have any more of these? We would like to have 1-2 stories like this for each of the grade levels so that we do trainings at the start of each semester of science. Thank you–that’s great to hear!! I have other articles/stories that I have used for this same strategy; however, none that are original like this. If you’d be interested in discussing some collaboration around creating something together over the summer, get in touch with me on the contact form to let me know. ← Is the iPad Mightier Than the Interactive Whiteboard?